Protect your home from harmful UV rays with professional window tinting. 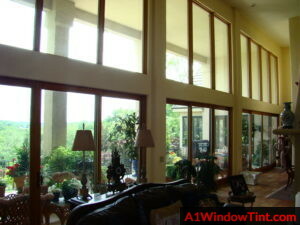 Lee’s Summit hom e owners will enjoy the perks of home window tint. Energy bills will lower and furniture or other home decor will be protected from the sun. The residential window tint gives your home the protection it needs from the harmful UV rays while still letting the sun to brighten your home. This film keeps your home’s temperature regulated so you don’t need to blast the AC, causing the bills to be outrageous. It allows you to live comfortably in your home without any worries of high temperatures or damage to your decor. This specific film also allows you and your family to have privacy from the outdoors. 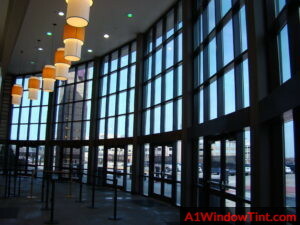 regarding the energy bills just by adding the window tinting film to your windows. Our film, designed for commercial businesses, works by blocking out the destructive UV rays that can cause office equipment to fade and make the inside temperatures uncomfortable. The outside maintains a reliable display with tinted film which allows employees privacy to complete their work without distractions. It eliminates irritating glare that can block the view of computer screens which frees you of the inconvenience of tricky blinds.